A vendor told me the other day he thinks I have an eye for the next hot thing. I don't think that's true, but I do pay attention to my environment. I never look at numbers. I don't monitor most sales. I have no idea how much whiskey we've sold this month. I watch people. I read blogs. I talk to customers. You can learn a lot about this business by listening to people (I think it was Thunderheart where Graham Greene tells Val Kilmer to "listen to the wind"). One thing I'm noticing right now is a downturn in limited edition enthusiasm. Last year at this time the harder something was to get, the more people wanted it. Now people are exhibiting more restraint. We've sold a good amount of Ardbeg Galileo over the past few days, but not at the speed which we preciously sold the Rollercoaster and Alligator. I still get a few emails here and there about the Buffalo Trace Antique Collection, but it used to be five a day. Last year, if you could find it at the store, it wasn't worth drinking. Now, people tend to be a bit less affected. I think we're witnessing a maturation of the Bourbon consumer as well as the Bourbon market. With everyone racing around to collect every last bottle of Stitzel-Weller they could find, some people never got around to trying the fairly basic brand expressions. One of my best customers just re-discovered Weller 12 Year Old recently. He said he prefers drinking it over some of his more expensive or rare selections. All that quality for $25. Who would've thought? Now that it's practically impossible to find some of the older, legendary bottles of American whiskey, people are starting to try the things they knew they could always drink, but never did. It's like last week when I finally got around, 25 years later, to finishing the second half of Risky Business (my credibility as an 80's film geek is now completely shot). Because I knew I could watch it whenever I wanted, I kept procrastinating! So what does that mean for Bourbon right now? With customers finding time for the standard, everyday bottles, they're going to gravitate toward consistency. As I wrote in another article a few days back, people are getting sick of playing the can-you-find-it game. They've been searching high and low for a bottle they can't get, or they've been taken by the romanticism of a new craft whiskey, only to realize they liked it half as much as their standard brand, yet paid twice as much. The old and rare are unobtainable, the young and new too brash, so customers are returning to the basics. The classics. A black T-shirt and a pair of jeans - a style that never gets old. The market is leading consumers back to Bourbon that's not sold out when they need it and continues to deliver quality time after time. It's leading them to that Bourbon they've been meaning to try, but never did. It's leading people to Four Roses. Why now? Four Roses has always been good. The Yellow is a solid rocks choice. The Small Batch, a fine sipper. The Single Barrel, always intense. The single casks we've selected for the store have consistently been the hottest deals around. Over the three years I've spent as spirits buyer at K&L, I've never heard customers mourn the loss of a bottle like they have for our first Four Roses selection. Yet, I've watched people pick over the Limited Edition selections repeatedly, looking for an older, more trendy Bourbon instead. Four Roses has been playing young Winnie Cooper for the last few years, but now she's all grown up and she's smoking hot. She's no longer the little girl next door you thought of as a friend. The problem now is that other people are taking notice and you may have some competition. That bottle of 2012 Limited Edition single barrel is gone from the shelf (thank you, John Hansell). In fact, I've sold twenty-six bottles of the regular single barrel over the past few days because I don't think people knew the difference. With Four Roses finally blooming for the market to see, I'm predicting one small craft distiller will emerge victorious from the rest of the pack, mainly because they're not releasing their own craft-distilled product. High West continues to impress the hell out of me, releasing two new whiskies over the past two months that are totally unique, yet consistent with their house style and flavor. The Campfire and the American Prairie Reserve are both fantastic whiskies with a special graininess that I'm beginning to associate with their Wild West image. Their packaging is terrific and they've really carved out their own niche in the market. The new whiskies actually taste like what I imagine cowboys drank at a campfire out on the prairie! David Perkins is slowly becoming the John Glaser of the American whiskey industry, yet he's also distilling, bunkering his whiskey away until it's actually ready to drink. Like I've written before, there's a small backlash brewing against young, expensive craft whiskies, so having the patience and ability to wait is paramount to success right now. It's getting to the point where I'm as excited about a new High West product as I am any major American distillery release. That's a serious thing to say. 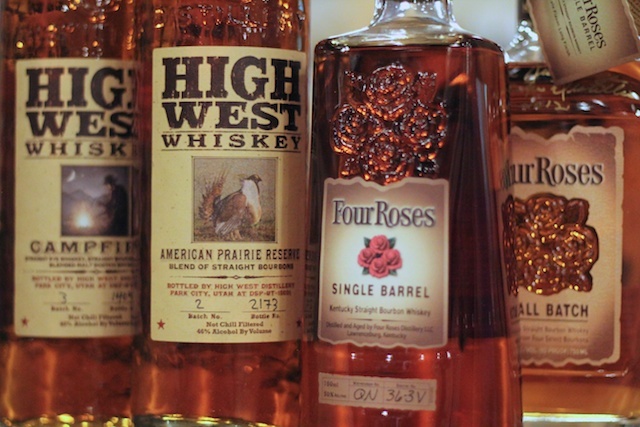 What Four Roses and High West have in common (besides the fact that Jim Rutledge taught David Perkins how to distill) is their drinkablilty. Their mainstay selections are not over-proofed and the flavors are complex yet inclusive. The whiskies don't punch you in the mouth, nor do they stand out as the loudest in the room. They're high-quality, polished products that deliver every time you drink them and are always on the shelf at a reasonable price. It's this direction that I think the market is gravitating. Affordable, delicious Bourbon that's available. It sounds crazy, I know. What a ridiculous business plan. However, in the booze business, where nothing is ever obvious, image plays a big role. Buffalo Trace has been the "cool" distillery in the class for three years running, but I think they're about to get some competition. Only time will tell. Let's see what happens.